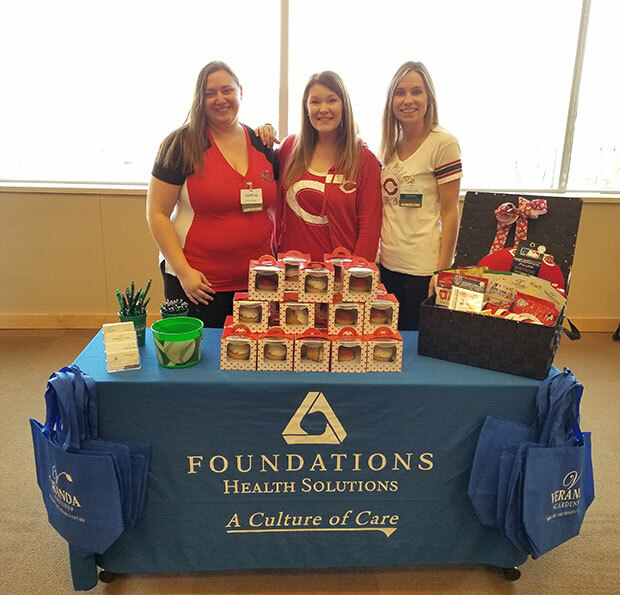 Jessica, Leah, and Kristen from Hearthstone, Taylor's Pointe, and Terrace View Gardens helped run the table for Foundations Health Solutions at the Spring Care Fair! Foundations was able to provide a raffle basket and have a table at the Care Fair. The Spring Care Fair was held at Good Samaritan Hospital in Cincinnati and the theme was the Cincinnati Reds. It's a great time seeing all the Social Workers and Nurses come together. The cupcakes and basket were a hit! We love our community and how we can connect together. We are committed to the highest level of quality, customer service, and creating a "Culture of Care" - inside of our facilities and in our community as well. With strong Christian values and heritage Foundations Health Solutions, are committed to serving our communities with the highest level of clinical excellence and resident satisfaction, along with a strong employee culture which places priority and resources on the direct caregiving team. Founded by Brian Colleran, Foundations Health Solutions is Ohio’s premier long-term care company. Formerly doing business as Provider Services, our team of experts has more than 15 years of experience successfully supporting over 100 multifaceted long-term and short-term care facilities.